Our look back at The Twilight Saga — in honor of the fifth anniversary of the final installment — continues with this New Moon Q&A with Kristen Stewart, Robert Pattinson and Taylor Lautner. Pulled from the files of our sister publication Film Fantasy, it was conducted at the 2009 San Diego Comic-Con where the trio of actors met with the press. As they spoke, all three were well aware that pandemonium (or should that be fandemonium?) would be awaiting them a few hours later. While the trio were talking The Twilight Saga in general, New Moon in particular, and the impact all of it had had on their lives, outside thousands of fans were on line — some for a couple of days! — to see them in the convention center’s Hall H, where a year earlier fans had broken the sound barrier with their screams and applause. At this particular moment, though, it was an opportunity for questions to be asked and answers to be given in a more subdued setting. J-14: Robert, in the book, even though you leave Bella, you’re very much an integral part of her thoughts. I know that can be a challenge to represent onscreen. How did you and director Chris Weitz try to accomplish this? ROBERT PATTINSON: Well, it’s through a kind of process. It’s just a voice. Edward’s just a voice in the book, and so I guess it would look pretty cheesy if it were just my voice. They’ve done these hallucinations, these semi-visible apparitions. KRISTEN STEWART: It’s suggestive. It’s how she remembers him, not necessarily how he actually is. J-14: Taylor, can you talk about Jacob’s transformation in this movie and the personal transformation you went through to play the role? TAYLOR LAUTNER: When I was filming Twilight I knew that Jacob’s character changed a lot, so if I wanted to continue portraying him correctly, I had a lot of work ahead of me. So, as soon as I finished filming Twilight I started hitting the gym. I got a personal trainer. I started eating a lot of food, good food of course, like proteins, good carbs, cut the sugars. It was a lot of work, but it was definitely worth it. J-14: Kristen, in the Twilight series Bella’s story arc really starts to develop in New Moon. She becomes an active protagonist. Was it more difficult to prepare for the role this time around or vice versa? KRISTEN: I wouldn’t say that one was more difficult than the other. This is a severely emotional movie. That’s the one big difference. This movie is not about discovery or falling in love, which is sort of just an intense emotion, but this is like low and high points for her, too. She’s a manic depressive, basically. To have a character be able to pull her out of that, it’s a hefty feat which I think we pulled off. But for me, there was no difference. It was just sort of heavier and it was more to think about. It’s a more mature part strictly because she’s older and she has more to deal with. J-14: Can you talk a little bit about how your lives have changed since we saw you here last summer? ROBERT: I don’t know. I’d like to think that I haven’t changed that much. Within myself I don’t think I’ve changed. I think I look down a lot. There’s something wrong with my neck [laughs]. No. It is kind of extraordinary. I don’t think that any of us expected any of this to happen and especially that the magnitude of this franchise seems to keep building and building. Comic-Con really was the eye opener and it’s just kind of gotten bigger and bigger. It’s an interesting thing to deal with. TAYLOR: I think that another thing that’s changed for me that’s kind of obvious is that the schedule has gotten really, really busy doing publicity and working on other things. It’s crazy. None of us saw it coming and since last year it’s definitely been a ride for all of us. KRISTEN: I cut my hair off. J-14: What would you each say have been the highs and the lows of this whole experience? KRISTEN STEWART: Well, this is definitely a high. I mean, there’s only been a couple of images from the movie that have been released and they’ve all been received really well. So I’m really excited for people to see some of it. [A special trailer was being shown at Comic-Con.] It’s a little overwhelming to have so many people here, but I guess that’s a good thing. TAYLOR: It’s awesome, because this is our opportunity to come out and thank our fans for everything that they’ve done for us and for Twilight. We get to embrace them again. We’re so thankful for them. So it’s awesome that we get to see them all waiting for us, again, a year later with the same, if not, actually definitely more passion and dedication. So it’s really exciting. I’m a little nervous, but it’s good. ROBERT: I don’t know. I still think it’s so new to me, anyway. I can’t claim anything to be a low. I pretty much live an almost identical life apart from being recognized. That’s not exactly the worst thing in the world. 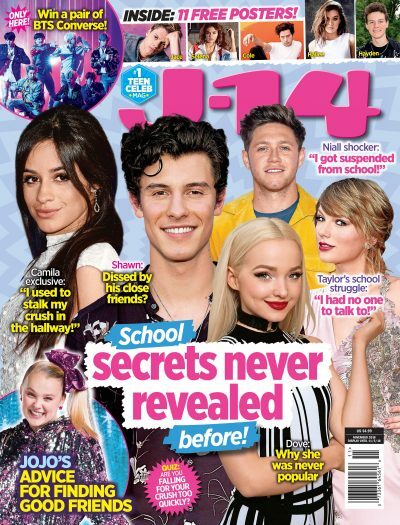 J-14: With all the attention and all the paparazzi following you, how do you manage to get anything normal done in your everyday life? ROBERT: I never do anything normal anyway. I just get other people to do it now [laughs]. J-14: How does this massive embracing of Team Edward and Team Jacob play into your performances? TAYLOR: I think that everything is kind of crazy about this franchise and that’s why we love it so much and that’s why the fans do as well. But, yes, there are definitely a lot of fans who are on the two separate teams. I don’t know. I mean, sometimes it gets me a little nervous, because I’m trying to live up to the fans’ expectations and trying to represent Team Jacob in the right way. I don’t want to disappoint them, so that’s why I worked so hard to not only mentally and emotionally, but physically change as well for this role, because this guy [Robert] is some pretty good competition. So I’ve done a lot of hard work. J-14: Rob, how has the experience of working with a new director been and what’s been the vibe on set this time around? ROBERT: I mean, it wasn’t just the director that made this one different. It was so different as well because we kind of knew what type of animal we were dealing with. I was much more of a supporting role in this one. I started three weeks after they started shooting and I did a lot of my first scenes doing the apparition [moments]. That’s a lot of me doing maybe one word per scene. It was actually one of the most relaxing jobs that I’ve ever done. Director Chris Weitz has a really peaceful presence and I got on really well with him. I had a pretty much stress-free job for three months. It was great for me. All the pressure was on Taylor [laughs]. J-14: Taylor, when you see the trailer for the first time and watch yourself morph, what goes through your mind? You turn into a fan, I’m sure. TAYLOR: I thought that they did a pretty good job with the wolf transformation. I’m excited that there are werewolves involved now, because the werewolves definitely step up the action in the movie. There is double the action in this movie than there was before, and there’s also a different dynamic. Now it’s not just this romance between a human girl and a vampire, but it’s the beginning of a love triangle and that’s exciting. KRISTEN: We’ve only seen the clips that they’re going to show today. We saw them this morning. TAYLOR: Yes, we’ve seen just about as much as the fans have seen. J-14: Are you anxious to see the final movie? KRISTEN: I think it’s a different kind of anxious, but yes, definitely. ROBERT: It looks aesthetically very different. The script was very different. It’s a completely different mood. So I’m really interested to see how it works out. J-14: Do you have a favorite scene from this film that stands out as your favorite one to shoot and why? KRISTEN: [to Taylor] Well, your favorite scene didn’t turn out to be your favorite. TAYLOR: Oh, right. I have a lot of favorite scenes, so that’s a really difficult question for me. I like a lot of the cool action scenes I get to do, because I just had a lot of fun with those. Anyway [laughs], my original favorite scene was a really small scene that I just thought was kind of cute. TAYLOR: It was the scene where I walk her up to her door and say goodbye to her, and I’m going off to fight in the woods and she’s worried. She’s scared for me. I thought that it was kind of cute, but I also like the breakup scene. KRISTEN: Yes, that’s my favorite scene in the movie. We call it a breakup scene, because he basically tells her that they can’t be friends anymore and he’s transforming. TAYLOR: It was also painful to shoot, because it was thirty-five degrees and rain was pouring on us — rain tower rain, which is straight from the spring… It was bad! J-14: Rob, do you have a favorite scene or moment? ROBERT: I think my breakup scene was my favorite scene. I mean, hopefully it’ll come off as having quite a few more levels than the relationship in Twilight. It was interesting. It was like a five-page long dialogue scene. That didn’t happen at all in the first one and it’s quite an interesting little moment. It completely bypasses all the supernatural elements of the story, as well, which I found quite interesting. J-14: Why do you think people embrace these stories now, the themes, the characters, the subject, the darkness, the romance? KRISTEN: I don’t know. That’s the most common question and we get that all the time. TAYLOR: I think a lot of the characters are relatable and there are so many different ones. People can relate to different characters and their experiences. KRISTEN: It’s just like anything else, like any movie. You could say that about anything: you relate to the characters. I always say that it’s because it’s first person narrative and you’re so very much inside of her head that it’s like — I don’t know — closer to home. You feel like it’s not happening to someone else. You feel like it’s sort of happening to you. J-14: Can you talk about why teenagers love vampires? ROBERT: I think we’re the worst people to ask about it. I don’t know, the problem is that when I looked at it I never looked at it as a vampire story, right from the beginning. When I try to play it, I try to eliminate the vampire element as much as I can and just kind of see it as a tool to make their relationship a little more fraught. Right after the audition I found myself kind of bizarrely invested in the story and I hadn’t even read the books at that point. I’ve kind of gotten more and more attached to it. I’ve been talking about the script for Eclipse to people over the last few weeks and I find myself getting very argumentative, which I’m not usually. They definitely have some kind of power. J-14: Which of the novels resonates the most for you as a reader or as an actor, and which are you most enthused about working in? TAYLOR: My favorite book was actually Eclipse. I’m pretty excited that, yes, it’s got action. The action levels continue to build in this series. So I think that I enjoy that, but also the fact that Twilight sets up the romance between Bella and Edward and then Bella and Jacob’s friendship grows in New Moon. But in Eclipse, it’s actually the three of them physically together and we have to team up and make this decision to try and be friends to protect her. I think that is like the ultimate high point of the series where it’s the love triangle in Eclipse. So I’m excited to get going. KRISTEN: I liked New Moon just in terms of how far I can push myself within the series. I feel like after New Moon it’s sort of smooth sailing for Bella. She’s very, very solid and content and happy. But in the second one she’s nothing, literally. Just lost. I got to find her again. But, yes, the second one for sure. ROBERT: I think that New Moon was my favorite book as well, mainly because so many people look at Edward like a romantic hero, but in New Moon he’s just so humbled. It’s a character who’s looking at Bella and thinking that he loves something too much, that he can’t be around. He deliberately starts breaking up their relationship, which I think is a very relatable thing and I think is very kind of painful. And the fight sequence at the end. Bella ends up saving Edward as she does in every single one of the books. So it’s really funny how everyone looks at Edward as the hero and he’s been continuously saved by the damsel in distress. I think he really realizes that in New Moon. Eclipse is really him trying to catch up with Jacob, because he’s so out of the loop and he can’t speak in superlatives anymore. He’s accepted being who he is and he needs to catch up to Jacob. So I always liked New Moon. J-14: Will each of you tell me the one Twilight question that you never want to answer again? ROBERT: What’s it like kissing Taylor Lautner? TAYLOR: To growl. Actually, I get asked that all the time by fans. They ask me to growl for them and I really don’t enjoy doing that [laughs]. So that’s for the fans. Please, don’t ask me to growl. Just wait for the movie. KRISTEN: You can ask me anything you want.